If you thought Mayor Bloomberg’s proposed micro-dwellings were small, you haven’t seen Brooklyn's tiniest apartments - which are just 29" long! Okay, so calling them "apartments" might be a bit of a stretch - they're actually miniature scale dioramas by Patrick Jacobs. Currently on view at Williamsburg’s Pierogi Gallery, the artist’s tiny tableaus even overlook the Gowanus Canal, which visitors can glimpse right through their tiny windows. 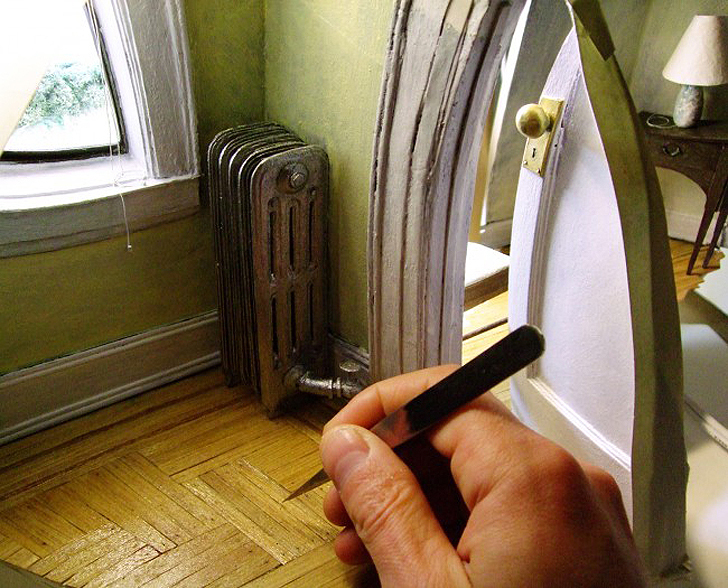 Each of Jacobs’ carefully detailed dioramas is meticulously cut by hand with the fine sharpened end of an Exacto knife. No detail is spared, from vintage doorknobs to hardwood floors to tiny radiators, each object looks as though it was lifted from one of the historic apartments that dot Brooklyn. The rooms even have a view of the adjacent and familiar Gowanus Canal, visible through a set of windows that come complete with a New York staple – fire escape stairs. In the gallery setting, Jacobs’ pieces appear as a white wall with circles of light glowing from them. Viewers needn’t squint to view the miniature splendor of each piece, as each is covered with a large magnifying lens, which gives a fish-eye effect and pulls even the dark corners of the room into view. While the viewing lenses measure around 5 inches in diameter, the rooms themselves are around 29 x 21 x 21 inches, officially making them the smallest apartments in Brooklyn! The artist also creates elaborate miniature dioramas of gardens and lush fields to accompany the more urban apartment pieces. Jacobs’ tiny apartments can be seen at Pierogi Gallery until July 29th. Each of Jacobs’ carefully detailed dioramas are meticulously cut by hand with the fine sharpened end of an Exacto knife. No detail is spared, from vintage door knobs to hardwood floors to a tiny radiator, each looks as though it was lifted from the historic apartments that dot Brooklyn. The rooms even have a view, of the adjacent and familiar Gowanus Canal, visible through a set of windows that are complete with the New York staple- fire escape stairs. In the gallery setting, Jacobs’ pieces appear as a white wall with circles of light glowing from them. Viewers needn’t squint to view the miniature splendor of each piece, as each is covered with a large magnifying lens, which gives a fish-eye effect and pulls even the dark corners of the room into view. While the viewing lenses measure around 5 inches in diameter, the rooms themselves are around 29 x 21 x21 inches, officially making them the smallest apartments in Brooklyn! The artist also creates elaborate miniature dioramas of gardens and lush fields, to accompany the more urban apartment pieces.